Starfleet Headquarters is the outpost, located on Earth, from which the operations of the Federation Starfleet are managed. Located in San Francisco on Earth, Starfleet Headquarters was originally built in the 22nd Century to serve as the command base of the United Earth Starfleet. When the Federation Charter was signed in 2161 the existing Earth Starfleet was absorbed into the Federation Starfleet and their Headquarters was selected to serve as the command center of the new agency. While the existing campus was capable of handling Starfleet's operations initially, by the 2270s Starfleet's operations had expanded dramatically. Because of this growth the United States Military Base known as the Presidio was transferred to Starfleet's jurisdiction and additional administrative buildings were constructed for Starfleet's usage. Due to the risk of war with the Klingon and Romulan Empires in the 23rd Century, the Federation Council moved from their facility in Paris, France to an administrative building on the grounds of Starfleet Headquarters. To add further protection Spacedock was built in orbit parallel to Starfleet Headquarters. In 2286 Starfleet Headquarters coordinated disaster relief on Earth in response to the Cetacean Probe's assault upon Earth. Later, in 2293, Starfleet Headquarters would be the site of classified briefings on the proposed disarmament of the Klingon Empire and later the memorial service for Captain James T. Kirk following his death aboard the USS Enterprise-B. 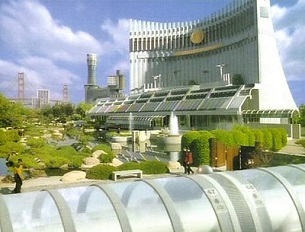 During the 24th Century the grounds expanded again and Starfleet Academy was relocated to the same base. Headquarters was, briefly, overrun by parasitic alien creatures in 2364 before they were defeated. Growing concern over the Dominion threat and the risk of Changeling infiltration led to many key players within Starfleet Headquarters to begin to question the decisions of the leadership of both the Federation and Starfleet, leading to a short coup that was quickly overcome. A short time afterward, however, war would break out between the Federation and the Dominion which led to increased security at the outpost and on Earth itself. The increased security helped to protect the outpost; however, in 2375, Headquarters was severely damaged in an attack by the Breen Confederacy. The base was quickly repaired and rebuilt - albeit with stronger defenses. In addition the Intrepid Class USS Voyager was made into a permanent exhibit on the base following its return from the Delta Quadrant. The outpost would be again damaged by the Borg Collective in 2381, but was quickly repaired and enhanced yet again. Late in the 24th Century Starfleet Headquarters would become more and more involved in operations in the Beta Quadrant with multiple response missions due to the growing threat raised by the Klingon Empire and the near destruction of the Romulan Empire. Following the creation of Olympus Island as part of the Atlantis Project Starfleet Headquarters briefly moved to a new complex located here; however, in 2427, Starfleet returned its operations to the original base in San Francisco. The organization is still in a period of transition as it struggles to respond to the events of Reunification and the death of its current Commander in Chief: Admiral Alin Mon.